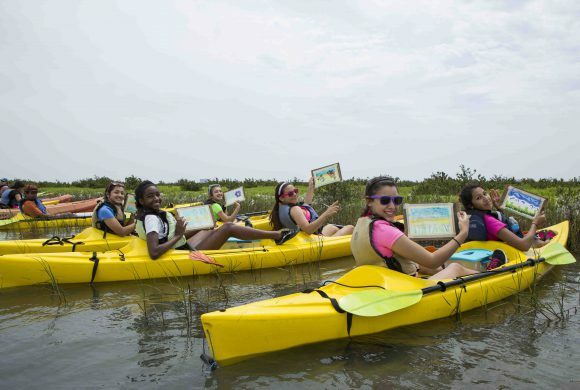 You can choose your Eco-Art Public Kayak Adventure from our public calendar or skip ahead to the Registration Page and view the Adventure Schedule there. Three and four hour adventures include a plein-air watercolor art experience. Two hour adventures do not include art. Please Note: Scheduled kayak adventures are listed on our website, but do not guarantee available seats. To check availability of a specific adventure please click on the link in Step 2 to “Book your kayak adventure now”. This link will have a current list of available seats for each adventure. $75 for three- and four-hour Adventures. Includes stop for watercolor demonstration and painting. $50 for two-hour Adventures. Two-hour adventures do not include art. 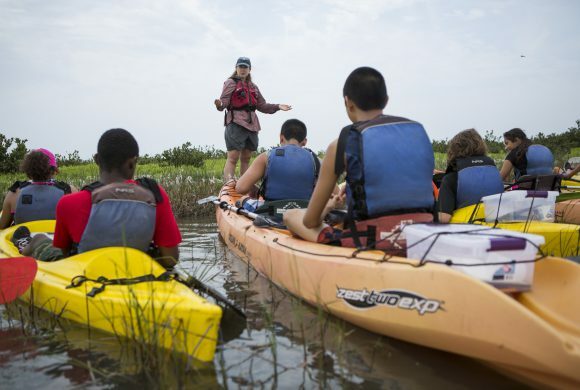 *All Adventures include tandem kayak, lifejacket, paddles, and guided instruction. 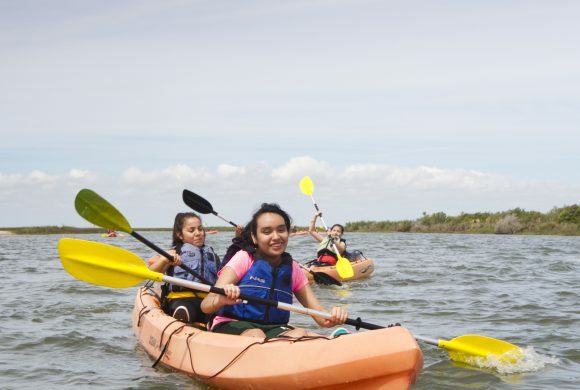 $50 for three- and four-hour Adventures if you bring your own equipment (kayak, paddle, and lifejacket). ***PLEASE NOTE that adventures at the Coastal Heritage Preserve include a 0.3 mile walk to the launch site and may not be suitable for bringing your own equipment. You would be responsible for carrying your kayak to and from the launch site. Please Read All Public Adventure Rules and Policies Before Booking Your Adventure. If you are late for an adventure or do not cancel at least 24 hours in advance, you forfeit your adventure. There are no refunds. Registration closes at midnight the day before a scheduled adventure. Address and cell phone are required for your booking contact. Pregnant women may not participate in a kayak adventure. Children must be at least 7 years old to participate in a 3-4 hour adventure, and 5 years old to participate in a 2 hour adventure. If children are under 50 pounds you must provide a Coast Guard Certified Personal Flotation Device. Adults with young children should expect to do all of the paddling. An adult from the same party is required in the kayak with each child under 13 years of age. Children 16 years or older may attend without an adult present as long as a parent or guardian signs the waiver and medical release. Check-in begins 15 minutes prior to the time of the adventure. Instruction begins at the time indicated on your itinerary, and is required to participate in the adventure. If you arrive late and miss the instruction session it is considered a late cancellation and no reschedule is permitted. There are no refunds. There is a $7.50 processing fee for reschedules. Reschedules must be done at least 24 hours in advance of check-in time. Early Cancellation – Call our office at least 24 hours in advance of check-in time. You may choose to reschedule or get a refund. In either case their is a $7.50 processing fee. Late Cancellation – If you cancel within 24 hours of the adventure you will forfeit the refund and there is no raincheck. In consideration of our other customers we do not wait on you if you are late, and it is considered a late cancellation. If We Cancel – We kayak rain or shine. It is a rare occurrence to cancel, but we will not cancel in unsafe conditions. Adventures will be cancelled at the kayak site ONLY at the time of check-in as weather may be inclement at one site but not another. In this case, rain checks are issued and are valid forever. There are no refunds.